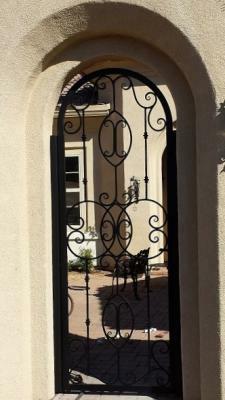 Signature Iron Doors’ wrought iron gates are durable and beautiful. Each piece of iron is hand forged and built to a specific design for a specific customer. This is a gate we did for a customer near Glendale Arizona. It was built to complement their entry and garage doors we built for them. Call us and come visit our showroom to see other iron products and how you can obtain a Signature Iron Gate.